1. The “already broken in” feature allows for a comfortable fit, right out of the box. 2. The 360 wrap around wrist strap and hook-and-loop enclosure provide excellent support. 3. Minimal amount of seams. 1. A bit “puffier” than other gloves on the market. 2. The wrist strap can slide around if you don’t secure it tightly. 3. They can become hot if you use them for a long period of time. 4. Better for bag/pad use than sparring. If you’ve been involved in boxing for any amount of time then you’ve no doubt come across a pair of Title Platinum Paramount Bag/Sparring Gloves. These gloves are considered the “go to” bag gloves for fighters of all levels—from beginners to world champions. Title has been manufacturing and selling boxing gear for quite some time now. 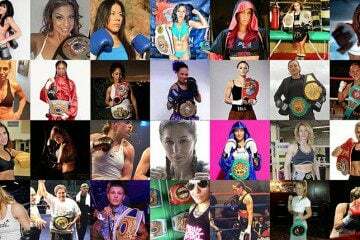 They also make and sell their own unique brand of boxing shoes, punching bags, handwraps, accessories, MMA gear, and more. Thousands of boxers and martial artists trust their hands with Title brand gloves. These gloves are known for being some of the most durable bag gloves on the market today. When you’re working your jabs, hooks and straights into the canvas, you want a pair of gloves that will stand up to plenty of punishment. You need padding that is protective and yet still has a little bit of give. With these gloves, the padding is already “broken in” so you start out with a level of comfort that is hard to beat. The Para-Mounted stacked cuff gives you excellent ergonomic support and coverage with every single punch. It keeps your wrist protected twisting and misfired punches. The exterior of the glove is covered in extra thick—yet pliable—full grain leather that is also extremely durable. In fact, Title gloves have a reputation for having some of the longest lasting leather that you can buy. The interior lining is made of a moisture-wicking material that helps to keep your hands dry and slip-free while you’re working the bags. The palms are vented to allow hot air to escape while you train. For more details about the Title Platinum Paramount Bag/Sparring Gloves, here’s our opinion on some individual features. These gloves are well known for providing excellent protection. The leather is extra thick—especially compared to most other boxing gloves. When it comes to wrist protection, these gloves provide a decent amount of coverage. One of the things you’ll notice immediately is that the hand compartment is slightly larger than other gloves. I didn’t feel like this was a problem, but it does feel a little different at first. The finger compartments have just enough give to allow for maximum power and impact, without sacrificing form. Due to the “already broken in” feature and the general design, you’ll probably find the padding to be more compact toward the middle of the gloves and thinner around the knuckles. This gives them a “soft” feeling. To us, these gloves seem light for 16 oz gloves, which has everything to do with how the weight is distributed. The Title Platinum Paramount Bag/Sparring Gloves are quite durable. Since they’re primarily bag gloves, they’re built for absorbing repeated shots in the same locations on the gloves. The leather is thick and strong and doesn’t wear down easily. The straps and stitching are secure and the thumb is larger than most other bag gloves I’ve seen. You can easily slide your hand into these without forcing them at all. When it comes to style, if you are looking for a pair of minimalist gloves, then this are the right pair for you. The simple black leather with white trim is attractive yet understated—for the fighter who would rather make a statement with his striking than his gloves. The TITLE logo is featured prominently on the outside of the glove and wrist strap. I found these gloves to be extremely comfortable, no doubt due to the “already broken in” aspect. When you try them on, your hands and fingers will feel nice and snug, without being too tight. 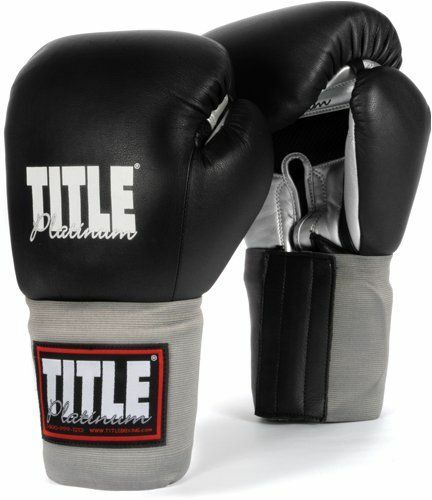 If you choose to spar with your TITLE gloves, then you’ll definitely want to go with the 16 oz gloves. This simply provides the best level of protection for you and your sparring partner. If, on the other hand, you wish to use these gloves exclusively for working the bags and mitts, then you’ll want to choose the gloves that best match your weight class. When you’re working the bags and pads, you want a glove that will protect your hands yet retain the same “feel” as regular sparring gloves. Ultimately, I feel like the Title Platinum Paramount Bag/Sparring Gloves are a great choice for those individuals who want a good bag or pad workout.